Indicative mural designs by Sheyne Tuffery in collaboration with Weta Workshop and Year 12 art students from Rongotai College. 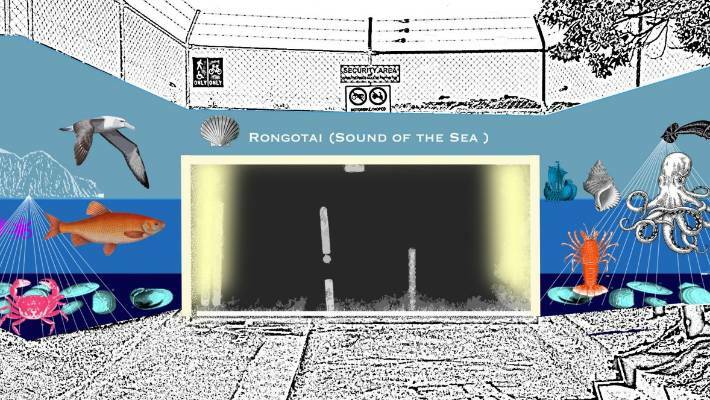 A new lick of paint, some bright lights and a sea creature or two are making a difference to Rongotai's subway tunnel. The Rongotai to Miramar tunnel, running under the airport runway, is being decorated with a sea-themed mural, thanks to Rongotai College students and artist Sheyne Tuffery. Tuffery had been out at the tunnel for the last couple of weeks, battling the winter weather to paint on a mural at both ends of the pedestrian tunnel. "I like the challenge of making something ugly beautiful," he said. He personally hadn't used the subway in a few years but remembered it as dark and feeling a bit unsafe when he had. Now it was being brightened up with the mural, as well as LED lights, new security cameras and a brighter tunnel. "I think it needs it too because the airport is getting bigger and bigger. It's a great access tunnel - the cyclists use it a lot too." Mayor Justin Lester said the mural would enhance the walking and biking connection, and the neighbourhoods on both side. "More importantly, they will bring life and meaning to the names of the suburbs on each side, and help highlight the area's history," he said. Centuries ago, Rongotai was likely completely underwater. Large earthquakes would have gradually raised it up out of the sea. In te reo, Rongotai means the sound of the sea. On the other side, Miramar gets its name from the Spanish and means sea view. Tuffery said the underwater theme immediately stood out for the mural. Along with Weta Workshop art director Paul Tobin, he went to the nearby Rongotai College to talk to senior art students and brainstorm ideas. "These guys were great," Tuffery said, "They came up with some great ideas." Tuffery and Tobin had three workshops with the students. Once Tuffery started working on the wall itself, several students came down to help put on the base colours. Work is estimated to take another couple of weeks, depending on the weather. For the paint to dry properly, it needed to be at least 10 degrees Celsius, with no drizzle or rain, Tuffery said - conditions that had been a little hard to come by recently. An exceptional opportunity to work with expert printer Sheyne Tuffery in a two-day workshop on the 6th and 7th of August (10am-4pm for both days). Sheyne will demonstrate techniques for making wood prints using traditional and experimental methods (as well as handy shortcuts) in colour and black and white. You'll walk away with a folio of handmade prints to hang on your wall or give as gifts. Suitable for beginners to advanced working at your own pace. Places are limited so bookings are essential. Price covers the full two days and all materials required. and with it notions of one ocean, one people, one place. as a food source, as a mean of transportation and as part of a rich cultural mythology. are represented in this exhibition, including local artist Esther Hansen. They offer new interpretations of the theme 'a sense of place' and solid reasoning behind their thinking. 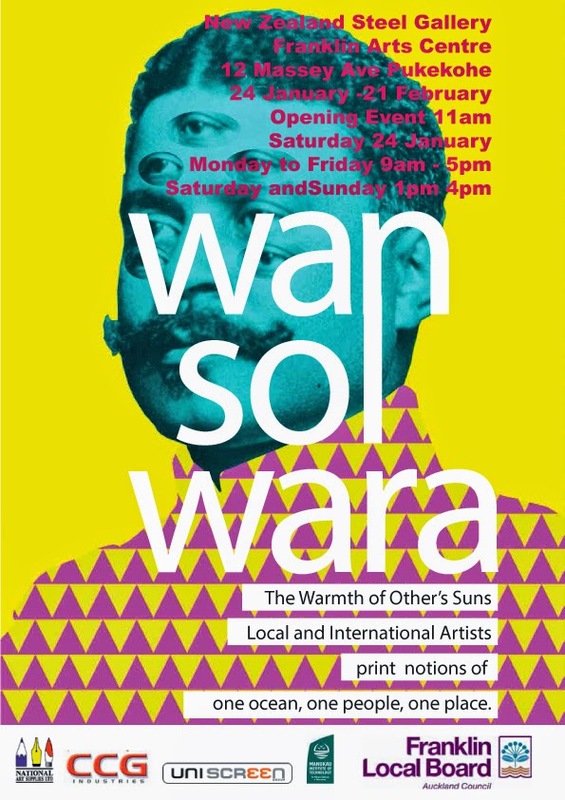 Collectively Wansolwara is a diverse, wide ranging and challenging print exhibition. Artists include: Chris Charteris and Sheyne Tuffery. Waiheke Community Art Gallery, 2 Korora Road, Waiheke Island, Auckland. Choosing from almost 370 entries submitted by New Zealand artists throughout the country, Judge Dr Anne Kirker has selected 50 finalist artworks for the 2015 New Zealand Painting and Printmaking Award.This award is our country’s most valuable, acquisitive cash award for New Zealand artists in the fields of painting and printmaking. The $20,000 prize is very generously sponsored by the Philip Vela Family Trust and they also purchase the winning artwork for their collection. Success in this competition has been a springboard for many of the winning artists who have moved on to significant careers in the contemporary art field. The judge for 2015 is Dr Anne Kirker. Her experience includes curatorial work in leading galleries in New Zealand and Australia. She was Adjunct Associate Professor at Queensland College of Art and now works as an independent art consultant, curator and writer. The finalist works will be exhibited during the Hamilton Gardens Arts Festival. The winner will be announced on 13 February 2015 at the awards ceremony; there will also be two merit awards presented. The public are invited to vote for the Peoples’ Choice award during the exhibition and the popular favourite wins a prize of art materials donated by Gordon Harris. The exhibition is the major visual arts event at the Hamilton Gardens Arts Festival and is FREE to the public. The exhibition will run from 14th February until Thursday 26th February 2014. A 100-metre long train mural has been installed on the façade of Johnsonville Countdown on Moorefield Road. This large-scale mural project was a joint initiative between Wellington City Council and Johnsonville’s community. Well known Wellington artist, Sheyne Tuffery, led the painting of the mural in collaboration with 11 school groups and youth organisation, Challenge 2000. Representatives from Johnsonville’s community, including from Lions and Rotary clubs, Johnsonville Shopping Centre, Countdown Johnsonville, Challenge 2000 and the Johnsonville Community Centre came together to form a mural steering group. They liaised with the Council’s Community Services and Arts teams and Northern Ward Councillor Justin Lester shaped up a plan to develop this large-scale mural. 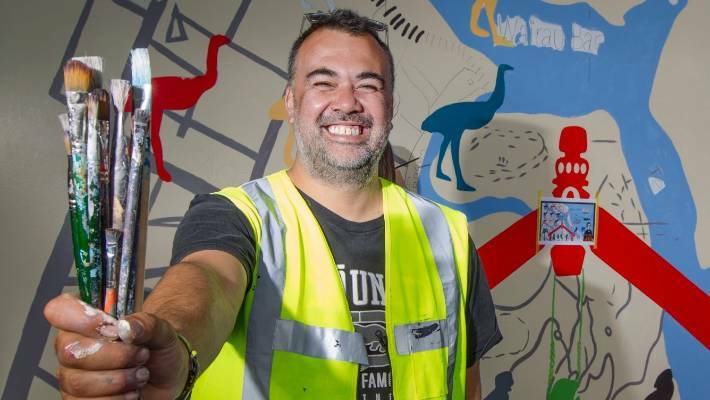 The aim of the project was to develop a striking mural in partnership with the community that tells the story of the development of Johnsonville as a suburb. Experienced artist Sheyne Tuffery was selected to lead the design and painting of the mural with the community. Tuffery has a strong connection to the northern suburbs, having grown up in Newlands. He has worked on many large-scale murals and his work is represented by galleries and held in collections across the country. Most recently he completed the Hopper Street mural in Mount Cook, where he currently lives. Sheyne worked with groups of students from 11 schools and with one community group – Challenge 2000, coordinating workshops and collaborating on the mural’s design. Each group was assigned a topic about Johnsonville’s development as a thriving suburb, from its settlement in 1841 when Frank Johnson moved to the area and began clearing vast tracts of trees and bush. Other topics include World War I and II, the Old Coach Road, the Johnsonville Railway line, the Tip Top Factory, and Centennial Highway. Schools were asked to select their preferred topic from a list shaped by Community Representatives. The most popular by far was the Johnsonville Railway line. This was clearly an important aspect in Johnsonville’s development. 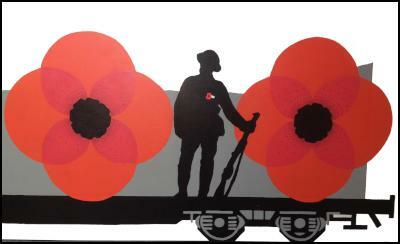 Sheyne made the decision to turn the mural into a train, each panel making up a different section to the train. This was a playful way to connect each panel along the length of the wall and to reflect the importance of the railway. The mural will be completed and installed by 16 December. Binding and Looping: Transfer of Presence in Contemporary Pacific Art brings together artists from Hawai‘i and the Pacific for whom fiber and concepts of binding are both a respected tradition and an inspiration for contemporary art. In their individual ways, these artists consider their indigenous binding and looping customs and at the same time incorporate different media to create new works in sculpture, printmaking, photography, painting, and video. The exhibition includes work by artists from Hawai‘i, Tonga, New Zealand, Cook Islands, Papua New Guinea, and Micronesia. Dr. Deborah Waite, professor of Pacific art history at the University of Hawai‘i at Manoa, is the curator. The artists include: Bernice Akamine, Maile Andrade, Kaili Chun, Brett Graham, Patsy Herman, Angelina Jilak, Florence Jaukae, Noelle Kahanu, Cathy Kata, Maria Kenda, Kapulani Landgraf, Marques Marzan, Moana Nepia, Ani O’Neill, Su‘a Sulu‘ape Petelo Alaiva‘a, Lisa Reihana, Filipe Tohi, Maika‘i Tubbs, Michel Tuffery, Sheyne Tuffery, Christina Wirihana. People all over the world have responded to the plight of New Zealand’s critically endangered Maui’s dolphin. The Government called for submissions and received over 20,000 from people in New Zealand and all around the world wanting immediate action to save Maui’s dolphin from extinction. As you know, Maui’s dolphin is the world’s smallest and most endangered marine dolphin. It is found only in New Zealand waters and the latest population estimate indicates only 55 adult dolphins remain alive. The sad truth is, they’re now outnumbered by our Members of Parliament. The future of Maui’s dolphin is now in the hands of those politicians. 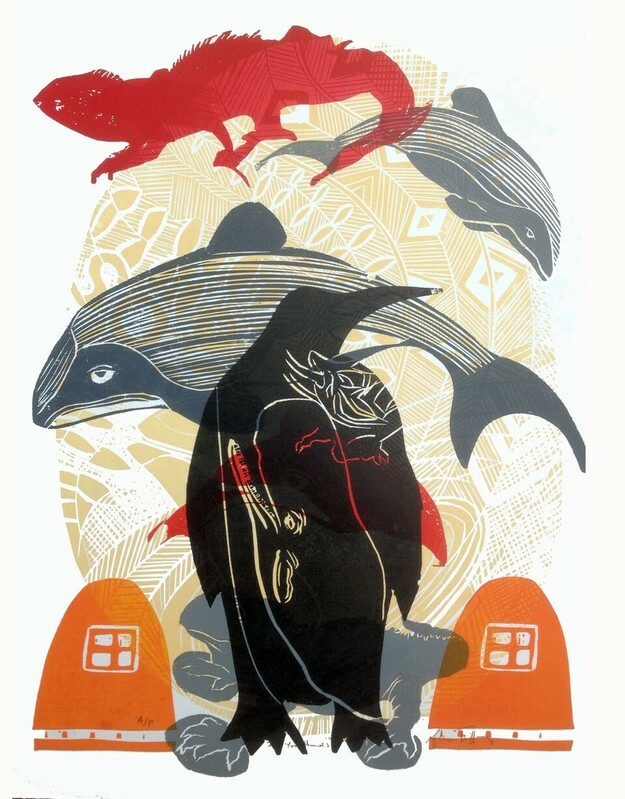 To highlight this point to them we commissioned Wellington artist Sheyne Tuffery to produce 55 artworks representing the alarmingly small Maui’s dolphin population.The beautiful handmade woodblock prints, aptly titled ‘In your hands’, feature Maui’s dolphins and a tuatara – another New Zealand species to have faced extinction but now considered a national treasure.